FULL SIZE: 40 ML | 1.35 FL. OZ. TRAVEL SIZE: 12 ML | 0.4 FL. OZ. Mist on this spray moisturizer for a boost of soothing hydration and a luminous complexion. Formulated with more than 20 percent botanical oils and humectants that leave skin dewy. 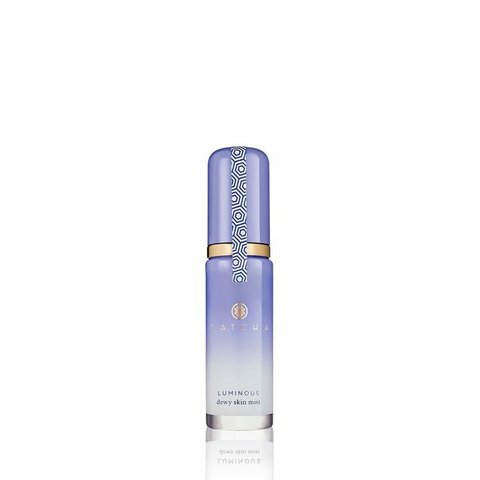 A proprietary complex of Okinawa Red Algae and hyaluronic acid delivers highly efficient hydration to the skin, acting as the ultimate moisture magnet. It's also infused with Hadasei-3™ Anti-Aging Complex, a trinity of Japanese anti-aging superfoods—green tea, rice and algae—that restores youthful radiance. The Dewy Skin Mist has a super-fine perfume sprayer, so it only takes 2-3 spritzes for your whole face. Use right before applying makeup so that it goes on flawlessly; when your skin is hydrated, makeup goes on more smoothly for a dewy, glowing look. Take it with you for easy touch-ups on the go; in just a couple spritzes, the Dewy Skin Mist refreshes skin and gives it an extra glow. Since makeup can steal away moisture from your skin, you can also spritz the mist over makeup to replenish moisture and prevent caking. It won't disturb makeup, so you can use it anytime, anywhere.